This stunning hand-blown art-glass vase is a high-style masterpiece. 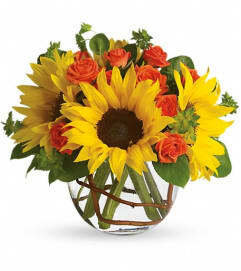 The rustic sunflower bouquet is more than a little bit country. 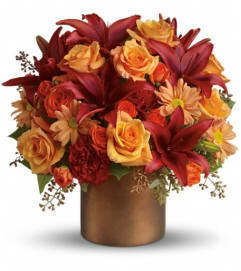 A delightful study in contrasts, it's the perfect Autumn gift. 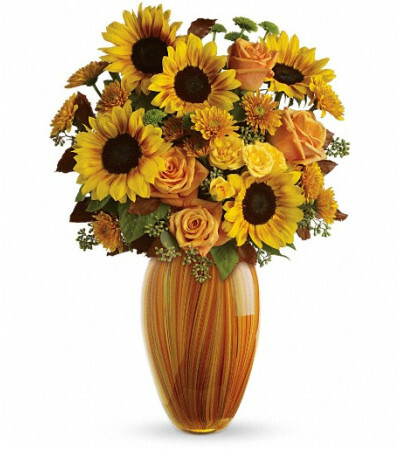 The distinctive bouquet includes light orange roses, yellow spray roses, yellow sunflowers, green button spray chrysanthemums and orange cushion spray chrysanthemums accented with assorted greenery.